THE 20th century's obsession with economy as the prime reality could earn for it the appelation of the 'Century of Economics'. Other centuries had equally pronounced preoccupations with their respective features of reality; the 19th century, for instance, was dominated by an obsession with the nation state. The point behind making such historical references here is to de-emphasise the current emphasis on economics. Earth politics argues that the obsession with economics is on its way out - largely in the face of ecological realities. In a situation where 10-20 animal or plant species are eradicated every day, some 3,000 sq m of forests disappear every second, 1,000 tonnes Of CO2 equivalents are emitted by human action every second and such abundant treasures of fish, soil and even fresh water become truly scarce, we cannot go on without drastically changing the direction of progress. Left to global markets, no solution to ecological problems will emerge. 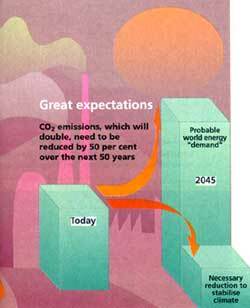 Consequently, a new 'reality' - ecological reality - will dominate the next century. Any economic action that is not in line with ecological laws will be considered destructive to human realities. This is why the 21st century will be the 'Century of the Environment'; not a golden age, but an age dominated by the grim ecological imperative which the 1992 Rio Earth Summit encapsulated in the term 'sustainable development', at the heart of which is the exhortation: do not consume more than you can replace. The areas which require immediate attention are: massive longterm reduction Of CO2 emissions; cutting down on the steeply rising demand for energy services which is likely to double in the next 30-40 years; and controlling the discrepencies between the users' needs and an ecological imperative to reduce resource use in sectors related to biodiversity, drinking water and soil losses. This makes for at least an average Factor Four (a revolutionary theory of resource efficiency; also, a book setting forth this new theory co-authored by the writer) in discrepency. Factor Four is then the main challenge - a primitive quantitative formula for an efficiency revolution needed to close the dangerous gaps. The task of closing the Factor Four discrepancy or gap is tremendous, but possible. Factor Four means that resource productivity - the amount of wealth extracted from any one unit of natural resource - can be quadrupled. This message is novel, simple and exciting. It is novel because it heralds nothing less than a new direction for technological progress. In the past, progress increased labour productivity. Now we add a new name to the game of technological progress: resource productivity. The message is also exciting. It says that much of that efficiency revolution is available 'at negative cost', that is, profitably. Countries engaged in the efficiency revolution become stronger in their international competitiveness. The message is even more exciting in that the new trend is bound to attract all nations. China, India, Mexico and Egypt, among others, have a supply of inexpensive labour but are short on energy. Their development will be smoother, swifter and safer if they make the quadrupling of resource productivity the centre of their technological progress. The race is on between the North and the South, and within the North, for a competitive edge in resource efficiency. Of course, there are problems. Changing the direction of progress is not an easy exercise. The people - consumers and voters, managers and engineers, politicians and communicators have to be the prime motivators of change. People do not change their needs unless they have good reasons to do so. Reasons for changing direction, for the Factor Four revolution, are both moral and material: the moral argument is simply the ecological challenge outlined above; the economic argument is that money invested now in the efficiency revolution will yield returns for the next generation of shareholders. Conversely, if efficiency investments are further delayed, ruptures and huge capital destruction are likely to result. Countries waiting and hesitating are likely to suffer formidable losses in their capital stock which may well also soon become obsolete. How can the efficiency revolution be brought about? By making it profitable. This can be done by a mix of measures, including de-subsidising resource use, consumer education, demand-side management, least-cost planning, high fees for solid waste disposal, environmental auditing and ecological tax reforms. Much, however, will always be left to individual initiative. One major problem in all of this is 'transaction costs' costs relating to all the human actors involved. All of them have their own preoccupations, training and habits; some have interests in capital invested in existing structures. They may theoretically believe the efficiency revolution to be reasonable and profitable, yet practically, not attractive at all. However, market conditions and public attention can be influenced. It is the right of capital owners and democratic majorities to ask for level playing field conditions for the efficiency revolution. Enlightened consumers can produce strong additional signals in favour of efficiency. Enlightened business brokers can start trading efficiency futures. Leasing can, to an astounding extent, replace the selling of products and lead to a business interest in durability rather than obsolescence. The most powerful push, however, could come from an ecologically-oriented tax reform. Why is it that in our present tax system, labour and capital carry the heaviest tax burdens while natural resource consumption goes tax-free or is even subsidised? Powerful economic arguments have come up recently indicating that an 'ecological tax reform' will make us richer and will create jobs. In the past, the increase in labour productivity has been spurred on by rising labour costs and ever increasing fiscal and para-fiscal burdens on human labour. Resource productivity, in contrast, has hardly been encouraged. Average raw material prices have fallen steadily due to the ever improving technologies for prospecting, mining, processing and shipment. As this kind of technological progress is likely to continue, market prices will keep telling our societies an untrue story of an eternally full cornucopia of natural resources. By the time either resources or the absorptive capacity of the environment nears exhaustion and prices begin telling a new story of scarcity, it could be too late. Ecological tax reforms can and should be designed in a way that capital destruction is avoided, which is possible if it is introduced very slowly but predictably. It should be revenue neutral. Social charges on human labour should be reduced as these make human labour unnecessarily expensive. In other words, the revenues - as from energy and material resource taxes - could be used to finance part of the social security system which otherwise has to be financed from employers' and employees' contributions. Ecological tax reform is an old idea, dating back to the British economist Arthur Cecil Pigou (1920). He observed that it would be good for the economy if fair prices were paid for the consumption of common goods. Taxes, he felt, should help adjust prices accordingly. Experience shows the superiority of markets over bureaucracies - and this view has gone into Factor Four. Per-verse incentive structures, bureaucratic obstacles and vested interests from the "other side" make it immensely troublesome to reap the potential benefits of the efficiency revolution. To overcome ihese obstacles, we offer a number of ideas for rendering the revolution a truly profitable business. Although these ideas are all based on successful experience and are rooted in market philosophy, progress has been slow in spreading them to other places and sectors. Objections from the ecological camp include the fear that efficiency would not help in a lasting reduction of resource consumption, not as long as resource prices keep telling a seductive fairytale of unlimited availability. 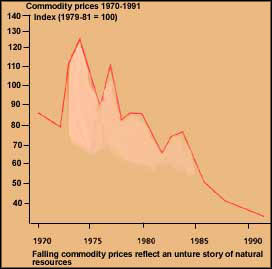 As a matter of fact, resource prices have been remarkably stable over the past 150 years. The share of expenses paid directly and indirectly for natural resources did not (on an average) increase until the oil price shocks of 1973 and 1978. All these obstacles can be overcome, but only by persistent and detailed attention to the real issues. It requires rewards for saving resources, not for wasting them; procedures for choosing the best buy first, then actually buying them; and competition in saving resources. None of these transformations will be quick or easy; but not making them commits us to solving problems that are far more difficult. Initial experience in Europe seems to suggest that for practical reasons direct pricing via taxes may be preferable. But the extreme political sensitivity of taxes may require a revenue-neutral tax reform. Even if resource prices were increasing more rapidly than efficency, no harm should be expected from ecological tax reform. It will be essential for the commodity exporting countries to recognise that the age of resource scarcity they all have dreamt of in the '70s may never become a reality. Progress in efficiency is likely to speed up and ultimately to exceed all potential market expansion for commodities. It will be wiser for these countries to go along with the trend and engage themselves in the efficiency revolution. Moreover, international lending institutions should stop most of the schemes for resource exploitation which tend to depress world market prices for the respective commodities. Countries who will take the initiative in introducing ecological tax reforms will gain a competitive edge. For industry, the main challenge in the efficiency revolution lies in the shift from selling products to selling services. In the US, the profits of energy service companies have risen but their sales per kw h have stagnated. 'Negawatts' have become more profitable than megawatts. The impact of the efficiency revolution may one day be equated with the microelectronics revolution. Microelectronics became mainstream only after the space research industry, under pressure of the imperative to reduce the weight of missiles, streamlined the technology. It is my belief that a combination of ecological exigencies, technological breakthroughs and sheer fashion will drive the efficiency revolution into the mainstream within 15 years. Developing countries, in particular, will need the efficiency revolution to meet development targets without grossly overextending their exploitation of already endangered environments. Costly classical pollution control measures are unlikely to be available. Efficiency measures, on the other hand, could be an attractive investment for private firms, lending institutions and governments. Our society today is in the grip of a severe but curable illness, not unlike the disease our grandparents called "consumption" (tuberculosis) because its victims wasted away. Today's economic tuberculosis consumes our resources, and its drain on people, nations and the planet is just as deadly, costly and contagious. We are told that industrialisation goes hand-in-hand with increasing levels of efficiency and productivity. Human productivity has certainly increased since the advent of industrialisation. But much of that increase has been by substituting resources for human labour. That substitution has gone too far, overusing resources like energy, water and soil. Gains in productivity are thus overwhelming the living systems that provide our resource base and must also assimilate the detritus of our civilisation. The belief that any solution to these environmental problems will be costly is wrong. The correction of these imbalances is not an investment without returns -- improving resource efficiency and healing the 'wasting disease' in fact represent fabulous economic opportunities. Asked how much material is wasted each year, most people would allow not a great deal is wasted. Actually, we are more than 10 times better at wasting resources than at using them. Most of the energy, water and transportation services we consume are wasted: the heat that leaks through the attics of poorly insulated homes; the energy from a nuclear or coal-fired power station, of which only three per cent is converted into light in an incandescent lamp (70 per cent of the original fuel energy is wasted before it gets to the lamps). Such waste impoverishes households, reduces competitiveness, imperils our resource base, poisons water, air, soil and people, and suppresses employment and economic vitality. Yet the wasting disease is curable. The cure comes from the laboratories, workbenches and production lines of skilled scientists and technologists, from the policies and designs of city planners and architects, from the ingenuity of engineers, chemists and farmers and from the intelligence of every person. It is based on sound science, good economics and common sense. It lies in using resources efficiently: doing more with less. It is the beginning of a new industrial revolution in which we can. achieve dramatic increases in resource productivity. Ways to do this have significantly expanded in the past few years, opening up wholly unexpected opportunities for business and society. Factor Four is a call to action on behalf of those opportunities in advanced resource efficiency. It shows practical, often profitable ways to use resources at least four times as efficiently as we do now. Or to put it another way, it means we can accomplish everything we do today and more - better - with only one-fourth the energy and materials we presently use. This would make it possible, for example, to double the global standard of living while cutting resource-use in half. Efficiency does not mean curtailment, discomfort or privation. To avoid that confusion, Factor Four talks of ,resource efficiency' or 'resource productivity' instead of 'resource conservation'.